In this video installation I aim to display the moment between life and death and the cycle that occurs within the human mind. During this cycle the mind is not sure where it is or if the body is dead or still living. The cycle starts out with exploration, where the mind is trying to figure out where it is, it then transforms into panic and fear. It then changes into realization and accepts that death is inevitable and fades into black, similarly to how our physical bodies fade into the ground and disintegrate. This moment is a dream-like out of body experience that occurs just before death as the body is still holding on. This end of life cycle is the last cycle within the larger circle of life that occurs. 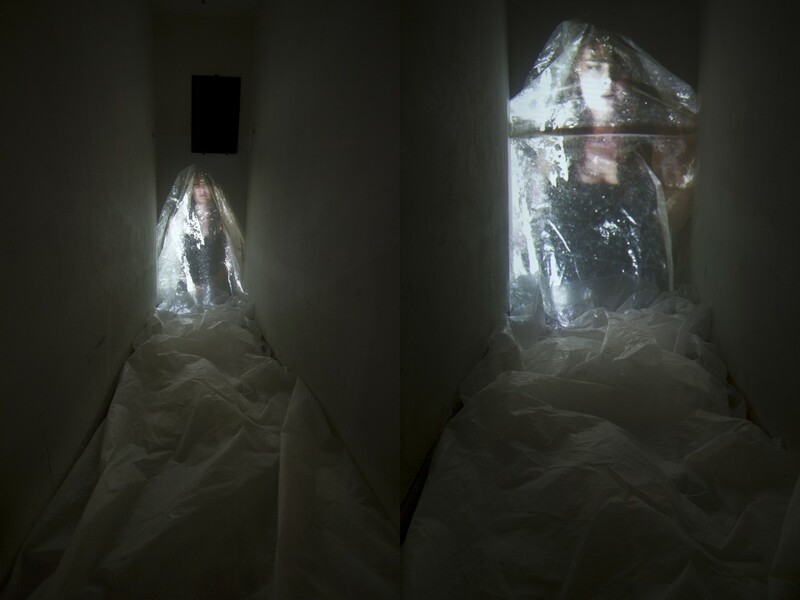 The mind, represented by the woman, is trapped inside the body, represented by the plastic. The plastic also serves as a field of preservation and protection as well from the outside elements. The mind is alive a little after the body dies, but then slowly dies with the body. The framing of the installation also resembles a coffin with plastic in the shape of a tombstone. The viewer experiences the cycle of life ending with the woman, but at the same time is separated from her by this plastic void, rendering her helpless. The plastic extends towards the viewer, like the path to our future demise. The viewer is unable to be there with her and is only able to watch her experience and be confined by this moment. This is similar to watching a human die in a hospital bed and not being able to help them as the pass through this cycle. My goal is to not have the viewer feel scared when thinking about their life ending, but instead see beauty in this moment of uncertainty. The angelic lighting on the women helps to ease this fear and accept death for what it is.